Show Me The Movies: Review: Ready Player one - Visually stunning blockbuster a must for retro gaming fans! Review: Ready Player one - Visually stunning blockbuster a must for retro gaming fans! After dealing with a more serious subject matter earlier in the year with the Post, iconic director Steven Spielberg returns this time around to the genre that he more or less invented, the big budget blockbuster with Ready Player One. Using With the source material of Ernest Cline's famous novel Ready Player One largely dealing with 80's nostalgia and retro returns to a world filled with nods to cinematic and gaming characters of this era it was probably apt that the man behind the lens was himself a hugely influential figure throughout this decade and one who would comfortably do the highly entertaining novel justice when it came to the big screen. 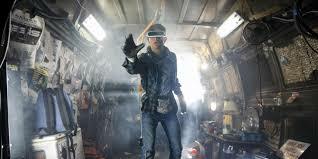 Ready Player One is set in 2045, with the world on the brink of chaos and collapse.The people, however, have found salvation in the OASIS, a virtual reality universe created by the brilliant and eccentric James Halliday (played by Mark Rylance). When Halliday dies, he leaves his immense fortune to the first person to find a digital Easter egg he has hidden somewhere in the OASIS, sparking a contest that grips the entire world. As a pupil of the 80's cinema and a fan of all things retro from that era to say that I was eager to see what the master of that period could conjure up would be a massive understatement and gladly in the most part, he did not disappoint. Straight from the first scene, the director assaults the senses and the whole experience almost resembles a 4D movie as we are taken on a rollercoaster ride through the OASIS with nods to nostalgic nuggets at every turn. The visual effects rival anything you will see on the big screen as we are swept away by the filmmakers imagination and a relenting pace to the whole adventure. Acting performances are solid on the whole, with Tyler Sheridan and Olivia Cooke wise casting choices for the two lead roles. Ben Mendelsohn, does let the side down slightly however, as the panto like Nolan Sorrento with a performance loaded with so much cheese,it should come with a warning for those who are lactose intolerant! As with most modern blockbusters it could do with a haircut of about twenty minutes or so and they are a few references to retro gaming that not all audience members will get. It also over indulges in sentimentality and can seem twee at times but overall Ready Player One is a high octane treat for the senses that will have fans of 80's gaming and pop culture grinning from ear to ear and gives us the first real quality blockbuster of 2018!